Exercise is a great addiction – and this one, I am sure we don’t mind getting hooked to. These days, in addition to gym routine – treadmill, cross trainer, 4 station, abs machine and bench, I have take a liking to running. Me and my pal Aman recently participated in community running. This was organized by ‘running and living ’, a group which promotes running. I somehow managed to complete the 5 Km run leaving my muscles stretched and cramped. 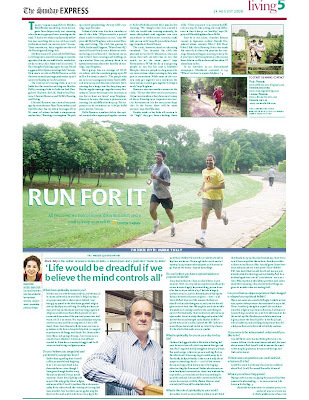 To our surprise couple of days later, we found ourselves splashed in an Indian Express article on ‘running for fitness’ in living section of the daily. I was quite surprised but liked it. That we appeared in the newspaper, we had to clear the ‘newspaper test’. A month of preparation, I felt extremely proud yesterday when I ran full 5 Kms, non-stop in 30 mins. What an experience and the elation of achieving it. It reinforces my belief that it’s all about setting up a goal and working towards it. It’s achievable. This one took just 20 days of preparation and it was possible. Of course I had the gym routine to back as well. So different from the school days when I used to shirk running. And here I was running after ‘running’ and enjoying it. Obviously other benefits include burning calories, toned up body and a good heart. Do want to pen my appreciation for Rahul Verghese for selflessly promoting running for fun. You could visit www.runningandliving.com to understand nuances of running.